1200 sissids which are paired as 600 passipsidos (compound of 2 sissids), also 600 gike pairs and 600 sissid-gike pairs (you can mix them). Also 600 sissids or 600 gikes. 1200 ikes paired up as 600 siddos (2-ike combo). 600 gad pairs, 600 gad-ike pairs, or only 600 gads or ikes. 3600 stips (snub cells) - theres actually room for 3600 pairs (7200) but these will blend to form scaliforms. 6000 trips (snub cells) - like above, there's room for 12,000 (6000 pairs), but they would blend into scaliforms. The 6000 trips form two groups - one of 2400 and one of 3600. 1200 tis (600 pairs) - or pick half of them. 6000 tuts - these form two groups, 4800 of them show up as 2400 pairs (snub cells), the other 1200 form a compound of 10 tuts (te). We could also pick half of the tuts and therefore 2400 snub tuts and 600 forming 5-tut combos (taki). 1200 siids (600 pairs) - also 600 2-sidditdids, 600 2-siddies, 600 siid-sidditdid pairs, etc. 600 radeds (ideds / ri) - we could pair them up to get 1200, but they lead to either scaliforms or exotics. Uniform idcossids can only have 600. 600 srids (saddids / sirds) - same as radeds. 4800 coes (ohoes / choes) - these pair up, you could have 2400 "daco" (2-co), "doho" (2-oho), "dicho" (2-cho), "ohoco" (oho+co), "cocho" (co+cho), and "ohocho" (oho+cho) pairs! - All uniform idcossids has one of these pairings. 600 coes (ohoes / choes) - the blending occurs here at the 120 5-co combo cells, or of course 5-oho, 5-cho combos, or none of these. Thats not so bad now is it - YIKES!!!! 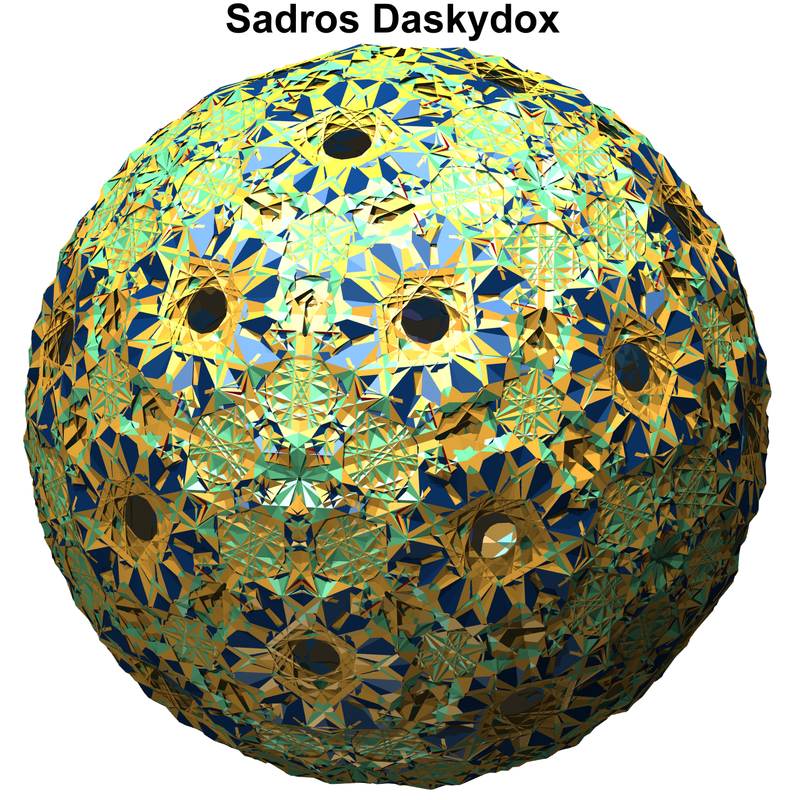 Before we get started with the listing, here are a few pics of the first two - Sadros Daskydox and Sadroshax. First up, a slice of each one. GEEYYAAAA!!!! ... Hang on! - these guys are hollow - lets look inside them, first comes Sadros Daskydox. YIKES!!! !, You could play Tomb Raider™ in that one! - Just think, these are only Cross Sections of the four dimensional objects and there are 175 others. These two are the only ones on this list of 177 that are not chiral. Both are non-orientable. 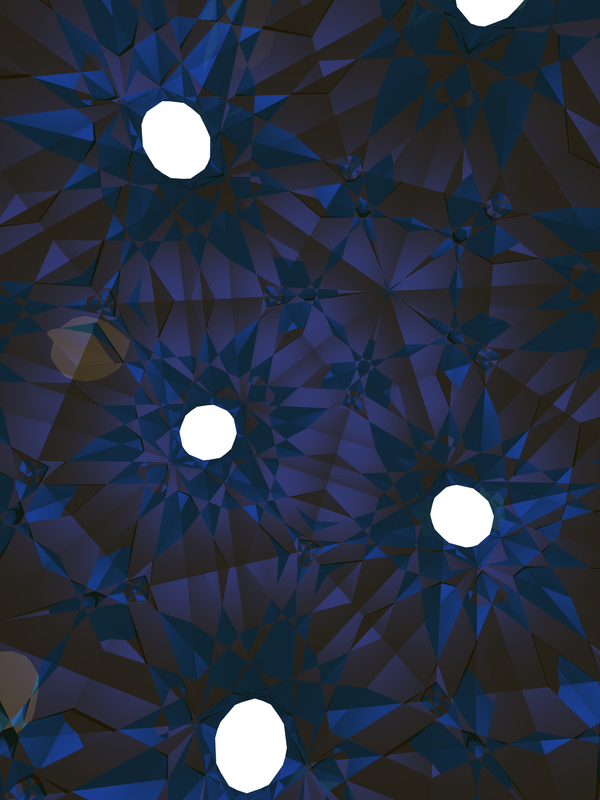 The vertex figures are shown in three views each. 1492. Sadros Daskydox - (SAD drose DAS kee dox) small diretrosnub disnub deca120dis600. Its cell combos are 600 2-ikes, 2400 2-ohoes, 2400 2-tuts, and 120 10-tuts. It is the blend of 10 sad phiddixes. 1493. 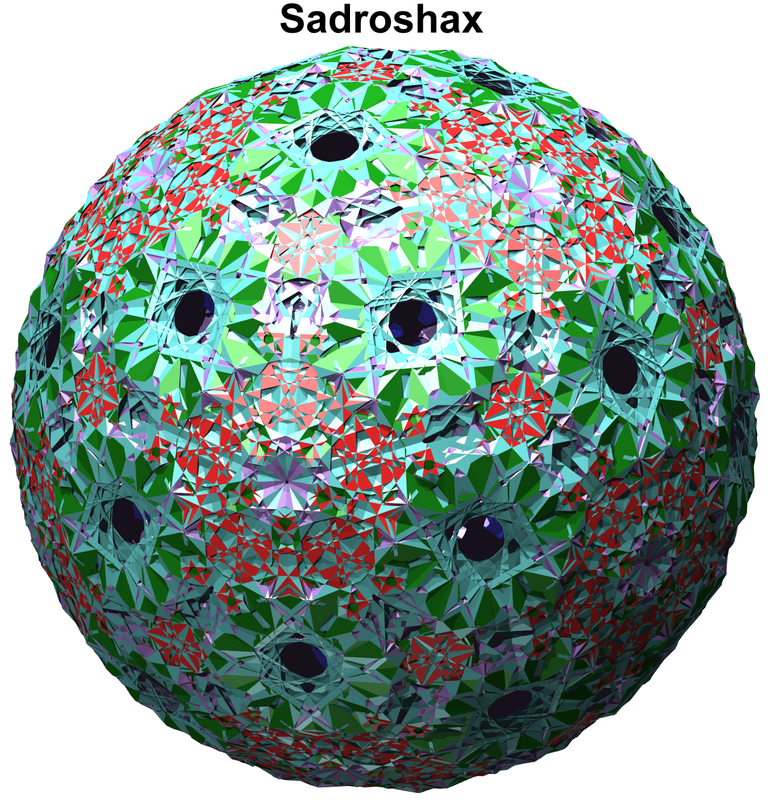 Sadroshax - (SAD dro shax) small diretrosnub hexa600. Its cell combos are 600 2-gikes, 600 2-ikes, 2400 2-ohoes, 600 2-siddies. It is the blend of 10 sidpid hixhis. 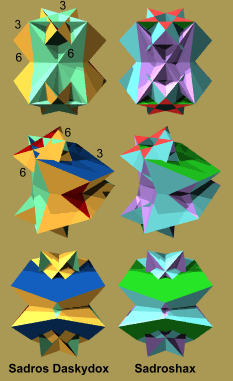 These eight have no hexagon faces and have "dacoes" (i.e. 2-co combos) for snub combo cells. All are non-orientable. 1494. Sadsedoxpix - (SAD sed DOX pix) small disnub dis600pentis600. Its cell combos are 600 2-gikes, 600 gad-ikes, 2400 2-coes, 600a radeds, 600a sidditdids, 600b sirds. It is the blend of 5 sidpid hixadies and 5 sidphixadies. 1495. Sidspodsid Xotex - (sid SPOD sid ZOE tex) small disnub prismatodisnub dis600tris600. Its cell combos are 600 2-gikes, 600a gads, 2400 2-coes, 600a radeds, 600a sidditdids, and 6000b trips. It is the blend of 5 sidpid hixadies and 5 sidpapixhis. 1496. Sadsapostuxdex - (SAD sa po STUX dex) small disnub prismatosnub tetris600dis600. Its cell combos are 600 2-gikes, 600a gads, 2400 2-coes, 600a radeds, 600 2-sidditdids, and 3600b stips. It is the blend of 5 sidpid hixadies and 5 siddip xappadies. 1497. Sadspid Sedoxdix - (SAD spid see DOX dix) small disnub prismatodisnub dis600dis600. Its cell combos are 600 2-gikes, 600a ikes, 2400 2-coes, 600a sirds, and 6000b trips. It is the blend of 5 sidphixadies and 5 sidpapixhis. 1498. Sidsaps Dextix - (SID saps DEX tix) small disnub prismatosnub dis600tris600. Its cell combos are 600 2-gikes, 600a ikes, 2400 2coes, 600a sirds, 600b sidditdids, and 3600b stips. It is the blend of 5 sidphixadies and 5 siddip xappadies. 1499. Sidsposidstix - (sid SPOSS id stix) small disnub prismatosnubdisnub tris600. Its cell combos are 600 2-gikes, 2400 2-coes, 600b sidditdids, 6000a trips, and 3600b stips. It is the blend of 5 sidpapixhis and 5 siddip xappadies. 1500. Sadspid Sopex - (SAD spid SO pex) small disnub prismatodisnub pentis600. Its cell combos are 600 gike-sissids, 600b ikes, 2400 2-coes, 600b radeds, 600b saddid, and 6000a trips. It is the blend of 5 sidpapixhis and 5 sidpuxthis. 1501. Sudsposhex - (SUD spo shex) small disnub prismatosnub hexis600. Its cell combos are 600 gike-sissids, 600b ikes, 2400 2-coes, 600a sidditdids, 600b radeds, 600b saddids, and 3600a stips. It is the blend of 5 siddip xappadies and 5 sidpuxthis. These 14 idcossids have hexagon faces but no tuts. They all have daco snub combo cells. The first two and the last one are orientable, all others are non-orientable. 1502. Sedspostuxtux - (SED spo STUX tux) small disnub prismatosnub tetris600tetris600. Its cell combos are 600 2-gikes, 600 2-gads, 2400 2-coes, 600a radeds, 600b tis, 600 sidditdid-siids, and 3600b stips. It is the blend of 5 sidpid hixadies and 5 siddip puxthis. 1503. Sudspeshax - (SUD spee shax) small disnub prismatosnub heptis600. Its cell combos are 600a gikes, 600a gads, 2400 2-coes, 600a radeds, 600b tis, 600b saddids, 600 sidditdid-siids, and 3600b stips. It is the blend of 5 sidpid hixadies and 5 siddip paxthis. 1504. Sadsapoxdex - (SAD sa POX dex) small disnub pentis600dis600. Its cell combos are 600 2-gikes, 600a ikes, 2400 2-coes, 600a sirds, 600b tis, 600b radeds, and 600b siids. It is the blend of 5 sidphixadies and 5 sidpaxid hidies. 1505. Sadstuxtex - (sad STUX tex) small disnub tetris600tris600. Its cell combos are 600 2-gikes, 600 2-ikes, 2400 2-coes, 600a sirds, 600b ris, and 600b siddies. It is the blend of 5 sidphixadies and 5 sabdupthixes. 1506. Sodsposdexpix - (SOD sposs DEX pix) small disnub prismatosnub dis600pentis600. Its cell combos are 600 2-gikes, 600 ike-gads, 2400 2-coes, 600a sirds, 600b tis, 600b siids, and 3600b stips. It is the blend of 5 sidphixadies and 5 siddip puxthis. 1507. Sadspid Staxdix - (SAD spid STAX dix) small disnub prismatodisnub tris600dis600. Its cell combos are 600 2-gikes, 2400 2-coes, 600b tis, 600b radeds, 600b siids, and 6000a trips. It is the blend of 5 sidpapixhis and 5 sidpaxid hidies. 1508. Spods Dusdextix - (SPODS dus DEX tix) small prismatodisnub disnub dis600tris600. Its cell combos are 600 2-gikes, 600b ikes, 2400 2-coes, 600b ris, 600b siddies, and 6000a trips. It is the blend of 5 sidpapixhis and 5 sabdupthixes. 1509. Sidsposidspox - (sid SPOSS id spox) small disnub prismatosnubdisnub pentis600. Its cell combos are 600 2-gikes, 600b gads, 2400 2-coes, 600b tis, 600b siids, 6000a trips, and 3600b stips. It is the blend of 5 sidpapixhis and 5 siddip puxthis. 1510. Spods Dospix - (spods DOS pix) small prismatodisnub disnub pentis600. Its cell combos are 600a gikes, 600b ikes, 2400 2-coes, 600b tis, 600b ris, 600b saddids, and 6000a trips. It is the blend of 5 sidpapixhis and 5 sidpathixhis. 1511. Sidsposidstux - (sid SPOSS id stux) small disnub prismatosnubdisnub tetris600. Its cell combos are 600a gikes, 2400 2-coes, 600b tis, 600b siids, 600b saddids, 6000a trips, and 3600b stips. It is the blend of 5 sidpapixhis and 5 siddip paxthis. 1512. Sidsposduxtix - (SID sposs DUX tix) small disnub prismatosnub dis600tetris600. Its cell combos are 600 2-gikes, 2400 2-coes, 600b tis, 600b radeds, 600 sidditdid-siids, and 3600a stips. It is the blend of 5 siddip xappadies and 5 sidpaxid hidies. 1513. Suds Dexpustix - (SUDS dex PUSS tix) small disnub dis600prismatosnub tetris600. Its cell combos are 600 2-gikes, 600b ikes, 2400 2-coes, 600b ris, 600 sidditdid-siddies, and 3600a stips. It is the blend of 5 siddip xappadies and 5 sabdupthixes. 1514. Sposdoshax - (SPOSS do shax) small prismatosnub disnub hexis600. Its cell combos are 600a gikes, 600b ikes, 2400 2-coes, 600b tis, 600b ris, 600b saddids, 600a sidditdids, and 3600a stips. It is the blend of 5 siddip xappadies and 5 sidpathixhis. 1515. Sedsposox - (SED spo sox) small disnub prismatosnub octis600. Its cell combos are 600 sissid-gikes, 600 ike-gads, 2400 2-coes, 600a radeds, 600a saddids, 600b tis, 600b siids, and 3600b stips. It is the blend of 5 sidpuxthis and 5 siddip puxthis. These twelve daco snubs have 3000 tuts. All of these are non-orientable. 1516. Sidsosphiheex - (sid SOS fa heex) small disnub snub pentis120heptis600. Its cell combos are 600 gike-sissids, 600a gads, 2400 2-coes, 600a radeds, 600 sidditdid-siids, 600b sirds, 120b 5-tuts, and 2400b tuts. It is a blend of 5 sidpid hixadies and 5 sidpaddy dixhis. 1517. Sidsoshexphi - (SID so SHEX fee) small disnub snub heptis600pentis120. Its cell combos are 600 gike-sissids, 600 2-ikes, 2400 2-coes, 600a sirds, 600b radeds, 600b tis, 120b 5-tuts, and 2400b tuts. It is a blend of 5 sidphixadies and 5 sidpixhixthis. 1518. Sidsoshaxphi - (SID so SHAX fee) small disnub snub hexis600pentis120. Its cell combos are 600a gikes, 600a ikes, 2400 2-coes, 600a sirds, 600b radeds, 600b sidditdids, 600b tis, 120b 5-tuts, and 2400b tuts. It is a blend of 5 sidphixadies and 5 sidphiddixadies. 1519. Sidsosphihax - (sid SOS fe hax) small disnub snub pentis120hexis600. Its cell combos are 600a gikes, 600 ike-gads, 2400 2-coes, 600a sirds, 600b radeds, 600b siids, 120b 5-tuts, and 2400b tuts. It is a blend of 5 sidphixadies and 5 sidphixdahixes. 1520. Sidsospid Sphipix - (sid SOS pid SFI pix) small disnub snub prismatodisnub pentis120pentis600. Its cell combos are 600 gike-sissids, 600b ikes, 2400 2-coes, 600b radeds, 600b tis, 6000a trips, 120b 5-tuts, and 2400b tuts. It is a blend of 5 sidpapixhis and 5 sidpixhixthis. 1521. Sidsospid Sphitux - (sid SOS pid SFIT ux) small disnub snub prismatodisnub pentis120tetris600. Its cell combos are 600a gikes, 2400 2-coes, 600b radeds, 600b sidditdids, 600b tis, 6000a trips, 120b 5-tuts, and 2400b tuts. It is a blend of 5 sidpapixhis and 5 sidphiddixadies. 1522. Sidsospid Stuxphi - (sid SOS pid STUX fee) small disnub snub prismatodisnub tetris600pentis120. Its cell combos are 600a gikes, 600b gads, 2400 2-coes, 600b radeds, 600b siids, 6000a trips, 120b 5-tuts, and 2400b tuts. It is a blend of 5 sidpapixhis and 5 sidphixdahixes. 1523. Sidsospid Sphidixdox - (sid SOS pid sfih DIX dox) small disnub snub prismatodisnub pentis120dis600dis600. Its cell combos are 600 gike-sissids, 2400 2-coes, 600b siids, 600b sirds, 6000a trips, 120b 5-tuts, and 2400b tuts. It is a blend of 5 sidpapixhis and 5 sidpaddy dixhis. 1524. Sidsospas Phihix - (sid SOS pas FI hix) small disnub snub prismatosnub pentis120hexis600. Its cell combos are 600 gike-sissids, 600b ikes, 2400 2-coes, 600b radeds, 600b tis, 600a sidditdids, 3600a stips, 120b 5-tuts, and 2400b tuts. It is a blend of 5 siddip xappadies and 5 sidpixhixthis. 1525. Sidsospas Phipix - (sid SOS pas FI pix) small disnub snub prismatosnub pentis120pentis600. Its cell combos are 600a gikes, 2400 2-coes, 600b radeds, 600b tis, 600 2-sidditdids, 3600a stips, 120b 5-tuts, and 2400b tuts. It is a blend of 5 siddip xappadies and 5 sidphiddixadies. 1526. Sidsospas Pixphi - (sid SOS pas PIX fee) small disnub snub prismatosnub pentis600pentis120. Its cell combos are 600a gikes, 600b gads, 2400 2-coes, 600b radeds, 600 sidditdid-siids, 3600a stips, 120b 5-tuts, and 2400b tuts. It is a blend of 5 siddip xappadies and 5 sidphixdahixes. 1527. 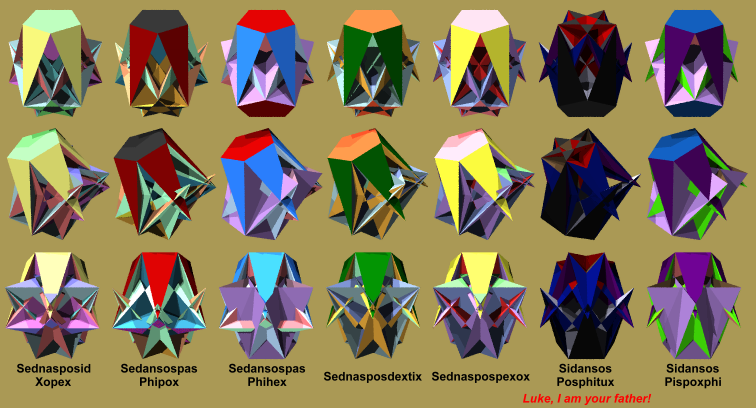 Sidsospas Phidextix - (sid SOS pas fid DEX tix) small disnub snub prismatosnub pentis120dis600tris600. Its cell combos are 600 gike-sissids, 2400 2-coes, 600b sirds, 600 sidditdid-siids, 3600a stips, 120b 5-tuts, and 2400b tuts. It is a blend of 5 siddip xappadies and 5 sidpaddy dixhis. These eight are "doho" snubs, meaning that they have 2400 2-oho combos for snub cells. None of these have square faces, i.e. 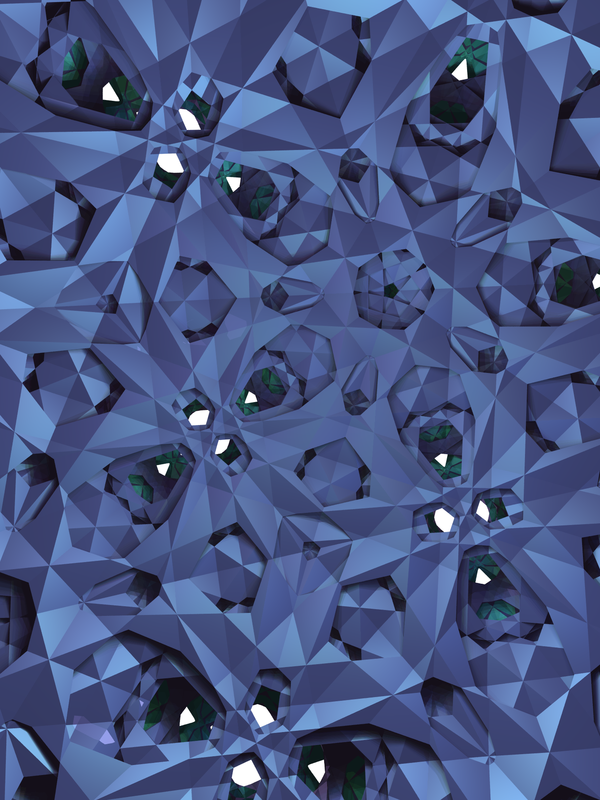 no prisms, or any other square faced polyhedron for a cell. The achiral pair mentioned at the top are also squareless doho snubs. These are all non-orientable. 1528. Sadros Stuxphi - (SAD drose STUX fee) small diretrosnub snub tetris600pentis120. Its cell combos are 600b gikes, 600 2-ikes, 2400 2-ohoes, 600b siddies, 120a 5-tuts, and 2400a tuts. It is a blend of 5 sad phiddixes and 5 sidpid hixhis. 1529. Sadros Sphipix - (SAD drose SFI pix) small diretrosnub snub pentis120pentis600. Its cell combos are 600b gikes, 600 ike-gads, 2400 2-ohoes, 600b ideds, 600b sidditdids, 120a 5-tuts, and 2400a tuts. It is a blend of 5 sad phiddixes and 5 sidpathihixes. 1530. Sadros Sphitux - (SAD drose SFIT ux) small diretrosnub snub pentis120tetris600. Its cell combos are 600 2-ikes, 2400 2-ohoes, 600b saddids, 600b tis, 120a 5-tuts, and 2400a tuts. It is a blend of 5 sad phiddixes and 5 side phixadies. 1531. Sadros Sphidixtix - (SAD drose sfid DIX tix) small diretrosnub snub pentis120dis600tris600. Its cell combos are 600b sissids, 600 2-ikes, 2400 2-ohoes, 600b ideds, 600b saddids, 120a 5-tuts, and 2400a tuts. It is a blend of 5 sad phiddixes and 5 sidputhixes. 1532. Sadrosid Xippix - (sa DRO sid ZIP pix) small diretrosnub dis600pentis600. Its cell combos are 600 2-gikes, 600 ike-gads, 2400 2-ohoes, 600 siddy-sidditdids, and 600b ideds. It is a blend of 5 sidpid hixhis and 5 sidpathihixes. 1533. Sadrosid Xutix - (sa DRO sid ZOO tix) small diretrosnub dis600tetris600. Its cell combos are 600a gikes, 600 2-ikes, 2400 2-ohoes, 600a siddies, 600b saddids, and 600b tis. It is a blend of 5 sidpid hixhis and 5 side phixadies. 1534. Sadrospixdox - (sa DROSS pix dox) small diretrosnub pentis600dis600. Its cell combos are 600 gike-sissids, 600 2-ikes, 2400 2-ohoes, 600a siddies, 600b ideds, and 600b saddids. It is a blend of 5 sidpid hixhis and 5 sidputhixes. 1535. Sedroshox - (SED dro shox) small diretrosnub heptis600. Its cell combos are 600a gikes, 600 gad-ikes, 2400 2-ohoes, 600a ideds, 600a sidditdids, 600b saddids, and 600b tis. It is a blend of 5 sidpathihixes and 5 side phixadies. These nine doho snubs have squares amongst their faces and sad phiddix as one of its blend components. All of these are non-orientable. 1536. Sadros Spoxphi - (SAD drose SPOX fee) small diretrosnub snub pentis600pentis120. Its cell combos are 600b gikes, 600 2-ikes, 2400 2-ohoes, 600b ris, 600b sirds, 120a 5-tuts, and 2400a tuts. It is a blend of 5 sad phiddixes and 5 sabdip xuthis. 1537. Sadersosposphitux - (SAY der sos POSS fe tux) small diretrosnub snub prismatosnub pentis120tetris600. Its cell combos are 600b gikes, 600a ikes, 2400 2-ohoes, 600b ris, 600b sidditdids, 3600b stips, 120a 5-tuts, and 2400a tuts. It is a blend of 5 sad phiddixes and 5 sicdip pidhixhis. 1538. Sadersospid Sphitux - (SAY der SOS pid SFIT ux) small diretrosnub snub prismatodisnub pentis120tetris600. Its cell combos are 600 ike-gads, 2400 2-ohoes, 600b srids, 600b siddies, 6000b trips, 120a 5-tuts, and 2400a tuts. It is a blend of 5 sad phiddixes and 5 sidpithipixes. 1539. Sadersospis Phipix - (SAY der SOS piss PHI pix) small diretrosnub snub prismatosnub pentis120pentis600. Its cell combos are 600 2-ikes, 2400 2-ohoes, 600b tis, 600b srids, 3600b stips, 120a 5-tuts, and 2400a tuts. It is a blend of 5 sad phiddixes and 5 siddip thipoxes. 1540. Sadersospistuxphi - (SAY der SOS piss TUX fee) small diretrosnub snub prismatosnub tetris600pentis120. Its cell combos are 600a ikes, 2400 2-ohoes, 600b tis, 600b srids, 600b sidditdids, 3600b stips, 120a 5-tuts, and 2400a tuts. It is a blend of 5 sad phiddixes and 5 sidpipdyhixes. 1541. Sadersospid Stuxphi - (SAY der SOS pid STUX fee) small diretrosnub snub prismatodisnub tetris600pentis120. Its cell combos are 600b sissids, 600a ikes, 2400 2-ohoes, 600b ideds, 600b srids, 6000b trips, 120a 5-tuts, and 2400a tuts. It is a blend of 5 sad phiddixes and 5 sicdip thipixes. 1542. Sadersospis Phidexdix - (SAY der SOS piss fi DEX dix) small diretrosnub snub prismatosnub pentis120dis600dis600. Its cell combos are 600 2-ikes, 2400 2-ohoes, 600b ideds, 600b srids, 3600b stips, 120a 5-tuts, and 2400a tuts. It is a blend of 5 sad phiddixes and 5 sibdip thipixes. 1543. Sadersosposid Stuxphi - (SAY der SOS po sid STUX fee) small diretrosnub snub prismatosnubdisnub tetris600pentis120. Its cell combos are 600b gikes, 600 ike-gads, 2400 2-ohoes, 600b ideds, 3600b stips, 6000b trips, 120a 5-tuts, and 2400a tuts. It is a blend of 5 sad phiddixes and 5 siddip dipthixes. 1544. Sadersosposid Stixphi - (SAY der SOS po sid STIX fee) small diretrosnub snub prismatosnubdisnub tris600pentis120. Its cell combos are 600a ikes, 2400 2-ohoes, 600b ideds, 600b saddids, 3600b stips, 6000b trips, 120a 5-tuts, and 2400a tuts. It is a blend of 5 sad phiddixes and 5 sidpid phixhis. These nine doho snubs have squares amongst their faces and sidpid hixhi as one of its blend components. All of these are non-orientable. 1545. Saderstuxtix - (SAY der STUX tix) small diretrosnub tetris600tri600. Its cell combos are 600 2-gikes, 600 2-ikes, 2400 2-ohoes, 600a siddies, 600b ris, and 600b sirds. It is a blend of 5 sidpid hixhis and 5 sabdip xuthis. 1546. Sadersposid Xotux - (SAY der SPOSS id ZOE tux) small diretrosnub prismatosnub dis600tetris600. Its cell combos are 600 2-gikes, 600a ikes, 2400 2-ohoes, 600 siddy-sidditdids, 600b ris, and 3600b stips. It is a blend of 5 sidpid hixhis and 5 sicdip pidhixhis. 1547. Saderspid Sadixtux - (SAY der spid sa DIX tux) small diretrosnub prismatodisnub dis600tetris600. Its cell combos are 600a gikes, 600 ike-gads, 2400 2-ohoes, 600 2-siddies, 600b srids, and 6000b trips. It is a blend of 5 sidpid hixhis and 5 sidpithipixes. 1548. Sadersposid Xopex - (SAY der SPOSS id ZOE pex) small diretrosnub prismatosnub dis600pentis600. Its cell combos are 600 gike-sissids, 600 2-ikes, 2400 2-ohoes, 600a siddies, 600b tis, 600b srids, and 3600b stips. It is a blend of 5 sidpid hixhis and 5 siddip thipoxes. 1549. Saderspostudex - (SAY der sposs TOO dex) small diretrosnub prismatosnub tetris600dis600. Its cell combos are 600a gikes, 600a ikes, 2400 2-ohoes, 600 siddy-sidditdids, 600b tis, 600b srids, and 3600b stips. It is a blend of 5 sidpid hixhis and 5 sidpipdyhixes. 1550. Saderspidshax - (SAY der SPID shax) small diretrosnub prismatodisnub hexis600. Its cell combos are 600 gike-sissids, 600a ikes, 2400 2-ohoes, 600a siddies, 600b ideds, 600b srids, and 6000b trips. It is a blend of 5 sidpid hixhis and 5 sicdip thipixes. 1551. Saderspostixtox - (SAY der sposs TIX tox) small diretrosnub prismatosnub tris600tris600. Its cell combos are 600a gikes, 600 2-ikes, 2400 2-ohoes, 600a siddies, 600b ideds, 600b srids, and 3600b stips. It is a blend of 5 sidpid hixhis and 5 sibdip thipixes. 1552. Sadersposid Sadixtux - (SAY der SPOSS id sa DIX tux) small diretrosnub prismatosnubdisnub dis600tetris600. Its cell combos are 600 2-gikes, 600 ike-gads, 2400 2-ohoes, 600a siddies, 600b ideds, 3600b stips, and 6000b trips. It is a blend of 5 sidpid hixhis and 5 siddip dipthixes. 1553. Sadersposidspox - (SAY der SPOSS id spox) small diretrosnub prismatosnubdisnub pentis600. Its cell combos are 600a gikes, 600a ikes, 2400 2-ohoes, 600a siddies, 600b saddids, 600b ideds, 3600b stips, and 6000b trips. It is a blend of 5 sidpid hixhis and 5 sidpid phixhis. These five doho snubs have squares amongst their faces but have neither sad phiddix nor sidpid hixhi as a blend component. All of these are non-orientable except for sadersapsox and sadrosepshix. 1554. Saderspeedshox - (SAY der SPEED shox) small diretrosnub prismatodisnub heptis600. Its cell combos are 600a gikes, 600 2-gads, 2400 2-ohoes, 600 sidditdid-siddies, 600a ideds, 600b srids, and 6000b trips. It is a blend of 5 sidpathihixes and 5 sidpithipixes. 1555. Sadersapsox - (SAY der SAP sox) small diretrosnub prismatosnub octis600. Its cell combos are 600 gike-sissids, 600 gad-ikes, 2400 2-ohoes, 600a sidditdids, 600a ideds, 600b srids, 600b tis, and 3600b stips. It is a blend of 5 sidpathihixes and 5 siddip thipoxes. 1556. 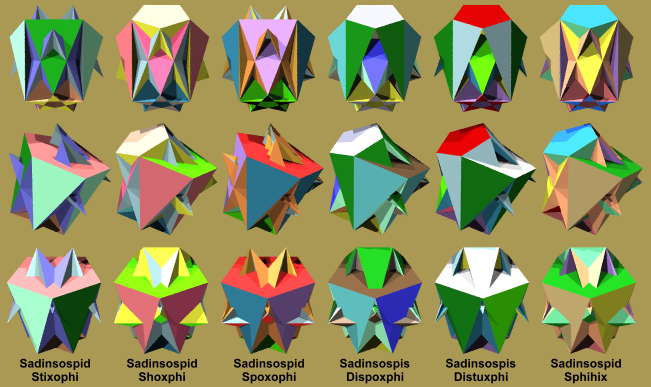 Sadrosepshix - (SAD dro SEP shix) small diretrosnub prismatosnub heptis600. Its cell combos are 600a gikes, 600a gads, 2400 2-ohoes, 600 2-sidditdids, 600a ideds, 600b srids, 600b tis, and 3600b stips. It is a blend of 5 sidpathihixes and 5 sidpipdyhixes. 1557. Sadrospashix - (SAD dro SPASH shix) small diretrosnub prismatosnub hexis600. Its cell combos are 600a gikes, 600a ikes, 2400 2-ohoes, 600a tis, 600a saddids, 600b ris, 600b sidditdids, and 3600b stips. It is a blend of 5 side phixadies and 5 sicdip pidhixhis. 1558. Sadrosposid Shax - (SAD dro SPOSS id shax) small diretrosnub prismatosnubdisnub hexis600. Its cell combos are 600b gikes, 600 ike-gads, 2400 2-ohoes, 600a tis, 600a saddids, 600b ideds, 3600b stips, and 6000b trips. It is a blend of 5 side phixadies and 5 siddip dipthixes. These ten are "dicho" snubs, which means that it has 2-cho combos as snub cell combos. These have no triangles as faces. All dicho snubs are non-orientable, also all idcossids below this point are non-orientable. 1559. Sidnostux - (sid NOS tux) small dispinosnub tetris600. Its cell combos are 600b gads, 2400 2-choes, 600b tis, 600b sirds, and 600a ris. It is a blend of 5 sidpaxhis and 5 snib dapixthis. 1560. Sednaspistux - (sed NAS pih stux) small dispinosnub prismatosnub tetris600. Its cell combos are 600b sissids, 600b gads, 2400 2-choes, 600b tis, 600a ris, and 3600b stips. It is a blend of 5 sidpaxhis and 5 sicdip pixthis. 1561. Sednaspastix - (sed NAS pa stix) small dispinosnub prismatosnub tris600. Its cell combos are 600b sissids, 2400 2choes, 600b siddies, 600a ris, and 3600b stips. It is a blend of 5 sidpaxhis and 5 sidphiphixes. 1562. Sednashox - (SED na shox) small dispinosnub heptis600. Its cell combos are 600a sissids, 600 2-gads, 2400 2-choes, 600a radeds, 600a siddies, 600b sirds, and 600b tis. It is a blend of 5 scadupthixes and 5 snib dapixthis. 1563. Sednasposhex - (sed NAS po shex) small dispinosnub prismatosnub heptis600. Its cell combos are 600 2-sissids, 600 2-gads, 2400 2-choes, 600a radeds, 600a siddies, 600b tis, and 3600b stips. It is a blend of 5 scadupthixes and 5 sicdip pixthis. 1564. Sednaspishax - (sed NAS pe shax) small dispinosnub prismatosnub hexis600. Its cell combos are 600 2-sissids, 600a gads, 2400 2-choes, 600a radeds, 600 2-siddies and 3600b stips. It is a blend of 5 scadupthixes and 5 sidphiphixes. 1565. Sodansip Saduxtix - (so DAN sip sa DUX tix) small dispinosnub prismatosnub dis600tetris600. Its cell combos are 600b sissids, 600 2-gads, 2400 2-choes, 600 2-tis, 600a sirds, and 3600b stips. It is a blend of 5 snib dapixthis and 5 sicdip pixthis. 1566. Sednasapspox - (SED na SAP spox) small dispinosnub prismatosnub pentis600. Its cell combos are 600b sissids, 600a gads, 2400 2-choes, 600a tis, 600a sirds, 600b siddies, and 3600b stips. It is a blend of 5 snib dapixthis and 5 sidphiphixes. 1567. Sidan Spostixtux - (se DAN spo STIX tux) small dispinosnub prismatosnub tris600tetris600. Its cell combos are 600 2-sissids, 600 2-gads, 2400 2-choes, 600a tis, 600b ideds, 600b sirds, and 3600a stips. It is a blend of 5 sicdip pixthis and 5 scaddip xuthis. 1568. Sidan Spistaxtix - (se DAN spe STAX tix) small dispinosnub prismatosnub tris600tris600. Its cell combos are 600 2-sissids, 600b gads, 2400 2-choes, 600a siddies, 600b ideds, 600b sirds, and 3600a stips. It is a blend of 5 sidphiphixes and 5 scaddip xuthis. These fourteen dicho snubs has one of two sets of "gike triangles" as faces, but no "ike triangles". 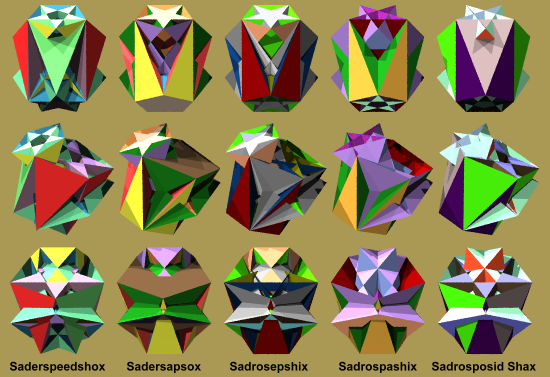 After I discovered the idcossids in 1997, I nick named one (sidansos posphitux) "Darth Vader" after the infamous sith lord, its vertex figure above will reveal the reason why - as a matter of fact, many of the dicho verfs look like Darth Vader - where are you Obi Wan! 1569. Sidnasdixdox - (sid NAS dix dox) small dispinosnub dis600dis600. Its cell combos are 600b gikes, 2400 2-choes, 600b tis, 600b srids, and 600a ris. It is a blend of 5 sidpaxhis and 5 sicdappixthis. 1570. Sidnaspox - (SID na spox) small dispinosnub pentis600. Its cell combos are 600b gikes, 600b gads, 2400 2-choes, 600b srids, 600b siddies, and 600a ris. It is a blend of 5 sidpaxhis and 5 sidpixhithis. 1571. Sidansostixphi - (se DAN so STIX fee) small dispinosnub snub tris600pentis120. Its cell combos are 600b gikes, 2400 2-choes, 600b sirds, 600a ris, 120b 5-tuts, and 2400b tuts. It is a blend of 5 sidpaxhis and 5 sidpid hiddixes. 1572. Sidnastixtux - (SID na STIX tux) small dispinosnub tris600tetris600. Its cell combos are 600 sissid-gikes, 600a gads, 2400 2-choes, 600a radeds, 600a siddies, 600b srids, and 600b tis. It is a blend of 5 scadupthixes and 5 sicdappixthis. 1573. Sodnosox - (SOD no sox) small dispinosnub octis600. Its cell combos are 600 sissid-gikes, 600 2-gads, 2400 2-choes, 600a radeds, 600 2-siddies, and 600b srids. It is a blend of 5 scadupthixes and 5 sidpixhithis. 1574. Sedansoshexphi - (se DAN so SHEX fee) small dispinosnub snub hexis600pentis600. Its cell combos are 600 sissid-gikes, 600a gads, 2400 2-choes, 600a radeds, 600a siddies, 600b sirds, 120b 5-tuts, and 2400b tuts. It is a blend of 5 scadupthixes and 5 sidpid hiddixes. 1575. Sednasposaxpox - (sed NAS po SAX pox) small dispinosnub prismatosnub 600pentis600. Its cell combos are 600 sissid-gikes, 600a gads, 2400 2-choes, 600 2-tis, 600b srids, and 3600a stips. It is a blend of 5 sicdip pixthis and 5 sicdappixthis. 1576. Sednasposid Xopex - (SED na SPO sid ZO pex) small dispinosnub prismatosnub dis600pentis600. Its cell combos are 600 sissid-gikes, 600 2-gads, 2400 2-choes, 600a tis, 600b siddies, 600b srids, and 3600a stips. It is a blend of 5 sicdip pixthis and 5 sidpixhithis. 1577. Sedansospas Phipox - (se DAN SOS pas FI pox) small dispinosnub snub prismatosnub pentis120pentis600. Its cell combos are 600 sissid-gikes, 600a gads, 2400 2-choes, 600a tis, 600b sirds, 120b 5-tuts, 2400b tuts, and 3600a stips. It is a blend of 5 sicdip pixthis and 5 sidpid hiddixes. 1578. Sedansospas Phihex - (se DAN SOS pas FI hex) small dispinosnub snub prismatosnub pentis120hexis600. Its cell combos are 600 2-sissids, 600a gads, 2400 2-choes, 600a tis, 600b radeds, 600b saddids, 120b 5-tuts, 2400b tuts, and 3600a stips. It is a blend of 5 sicdip pixthis and 5 sidpixthixes. 1579. 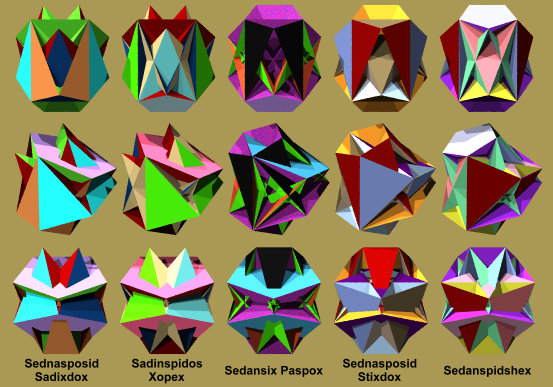 Sednasposdextix - (SED na sposs DEX tix) small dispinosnub prismatosnub dis600tris600. Its cell combos are 600 sissid-gikes, 2400 2-choes, 600a siddies, 600b tis, 600b srids, and 3600a stips. It is a blend of 5 sidphiphixes and 5 sicdappixthis. 1580. Sednaspospexox - (sed NAS po SPEK sox) small dispinosnub prismatosnub pentis600-600. Its cell combos are 600 sissid-gikes, 600b gads, 2400 2-choes, 600 2-siddies, 600b srids, and 3600a stips. It is a blend of 5 sidphiphixes and 5 sidpixhithis. 1582. Sidansos Pispoxphi - (se DAN sos pis SPOX fee) small dispinosnub snub prismatosnub pentis600pentis120. Its cell combos are 600 2-sissids, 2400 2-choes, 600a siddies, 600b radeds, 600b saddids, 120b 5-tuts, 2400b tuts, and 3600a stips. It is a blend of 5 sidphiphixes and 5 sidpixthixes. These 17 dicho snubs has one set of ike triangles, but no gike triangles. 1583. Sednispadistix - (SED ne spa DIST ix) small dispinosnub prismatodisnub tris600. Its cell combos are 600b ikes, 2400 2-choes, 600b siddies, 600a ris, and 6000b trips. It is a blend of 5 sidpaxhis and 5 sidphippixhis. 1584. Sedansposixdox - (se DAN spo SIX dox) small dispinosnub prismatosnub 600dis600. Its cell combos are 600b ikes, 2400 2-choes, 600b siids, 600a ris, and 3600b stips. It is a blend of 5 sidpaxhis and 5 siddip phixhis. 1585. Sadnisdextix - (SAD niss DEX tix) small dispinosnub dis600tris600. Its cell combos are 600b sissids, 600b ikes, 2400 2-choes, 600b sirds, 600a ris, and 600b siids. It is a blend of 5 sidpaxhis and 5 sidphixthis. 1586. Sidnaspidshox - (SID na SPID shox) small dispinosnub prismatodisnub hexis600. Its cell combos are 600a sissids, 600 gad-ikes, 2400 2-choes, 600a radeds, 600 2-siddies, and 6000b trips. It is a blend of 5 scadupthixes and 5 sidphippixhis. 1587. Sidanstix Pastix - (se DAN stix PAS stix) small dispinosnub tris600 prismatosnub tris600. Its cell combos are 600a sissids, 600 gad-ikes, 2400 2-choes, 600a radeds, 600 siddy-siids, and 3600b stips. It is a blend of 5 scadupthixes and 5 siddip phixhis. 1588. Sedanstuxtux - (SEE dan STUX tux) small dispinosnub tetris600tetris600. Its cell combos are 600 2-sissids, 600 gad-ikes, 2400 2-choes, 600a radeds, 600 siddy-siids, and 600b sirds. It is a blend of 5 scadupthixes and 5 sidphixthis. 1589. Sidnaspidspox - (SID na SPID spox) small dispinosnub prismatodisnub pentis600. Its cell combos are 600 gad-ikes, 2400 2-choes, 600a tis, 600a sirds, 600b siddies, and 6000b trips. It is a blend of 5 snib dapixthis and 5 sidphippixhis. 1590. Sedanspistaxdix - (se DAN spis STAX dix) small dispinosnub prismatosnub tris600dis600. Its cell combos are 600 gad-ikes, 2400 2-choes, 600a tis, 600a sirds, 600b siids, and 3600b stips. It is a blend of 5 snib dapixthis and 5 siddip phixhis. 1591. Sidnaspid Sodixtux - (SID na spid so DIX tux) small dispinosnub prismatodisnub dis600tetris600. Its cell combos are 600 2-gads, 2400 2-choes, 600a tis, 600a sirds, 600b ideds, 600b sidditdids, and 6000b trips. It is a blend of 5 snib dapixthis and 5 sibdip pidhixhis. 1592. Sednasposidspox - (SED na SPA sid spox) small dispinosnub prismatosnubdisnub pentis600. Its cell combos are 600a sissids, 600 gad-ikes, 2400 2-choes, 600a tis, 600b siddies, 3600a stips, and 6000b trips. It is a blend of 5 sicdip pixthis and 5 sidphippixhis. 1593. Sedanspostuxtix - (se DAN spo STUX tix) small dispinosnub prismatosnub tetris600tris600. Its cell combos are 600 2-sissids, 600 gad-ikes, 2400 2-choes, 600a tis, 600b sirds, 600b siids, and 3600a stips. It is a blend of 5 sicdip pixthis and 5 sidphixthis. 1594. Sednasposidshox - (SED na SPA sid shox) small dispinosnub prismatosnubdisnub hexis600. Its cell combos are 600a sissids, 600 2-gads, 2400 2-choes, 600a tis, 600b ideds, 600b sidditdids, 3600a stips, and 6000b trips. It is a blend of 5 sicdip pixthis and 5 sibdip pidhixhis. 1595. Sednasposidstux - (SED na SPA sid stux) small dispinosnub prismatosnubdisnub tetris600. Its cell combos are 600a sissids, 600b ikes, 2400 2-choes, 600 2-siddies, 3600a stips, and 6000b trips. It is a blend of 5 sidphiphixes and 5 sidphippixhis. 1596. Sadinsadox Postux - (sa DINSE a dox PO stux) small dispinosnub dis600 prismatosnub tetris600. Its cell combos are 600 2-sissids, 600b ikes, 2400 2-choes, 600 siddy-siids, 600b sirds, and 3600a stips. It is a blend of 5 sidphiphixes and 5 sidphixthis. 1597. Sednasposid Sedaxtix - (SED na SPA sid se DAX tix) small dispinosnub prismatosnubdisnub dis600tris600. Its cell combos are 600a sissids, 600b gads, 2400 2-choes, 600 siddy-sidditdids, 600b ideds, 3600a stips, and 6000b trips. It is a blend of 5 sidphiphixes and 5 sibdip pidhixhis. 1598. Sidnaspid Stextix - (SID na spid STEX tix) small dispinosnub prismatodisnub tris600tris600. Its cell combos are 600a sissids, 600 gad-ikes, 2400 2-choes, 600a ideds, 600a sirds, 600b siddies, and 6000b trips. It is a blend of 5 scaddip xuthis and 5 sidphippixhis. 1599. Sidanstux Pasidox - (se DAN stux PASS a dox) small dispinosnub tetris600 prismatosnub dis600. Its cell combos are 600a sissids, 600 gad-ikes, 2400 2-choes, 600a ideds, 600a sirds, 600b siids, and 3600b stips. It is a blend of 5 scaddip xuthis and 5 siddip phixhis. These six dicho snubs has one set of gike triangles and one set of ike triangles, both coming from one of the two component parts which is sidpip dixady. 1600. Sadinsospid Stixophi - (SA din SOS pid STIX a fee) small dispinosnub snub prismatodisnub tris600pentis120. Its cell combos are 600b gikes, 600b ikes, 2400 2-choes, 600a ris, 120b 5-tuts, 2400b tuts, and 6000b trips. It is a blend of 5 sidpaxhis and 5 sidpip dixadies. 1601. Sadinsospid Shoxphi - (SA din SOS pid SHOX fee) small dispinosnub snub prismatodisnub hexis600pentis120. Its cell combos are 600 sissid-gikes, 600 gad-ikes, 2400 2-choes, 600a radeds, 600a siddies, 120b 5-tuts, 2400b tuts, and 6000b trips. It is a blend of 5 scadupthixes and 5 sidpip dixadies. 1602. Sadinsospid Spoxophi - (SA din SOS pid SPOX a fee) small dispinosnub snub prismatodisnub pentis600pentis120. Its cell combos are 600b gikes, 600 gad-ikes, 2400 2-choes, 600a tis, 600a sirds, 120b 5-tuts, 2400b tuts, and 6000b trips. It is a blend of 5 snib dapixthis and 5 sidpip dixadies. 1603. Sadinsospis Dispoxphi - (SA din SOS pis dis POX fee) small dispinosnub snub prismatosnubdisnub pentis600pentis120. Its cell combos are 600 sissid-gikes, 600 gad-ikes, 2400 2-choes, 600a tis, 120b 5-tuts, 2400b tuts, 3600a stips, and 6000b trips. It is a blend of 5 sicdip pixthis and 5 sidpip dixadies. 1604. Sadinsospis Distuxphi - (SA din SOS pis DIS tux fee) small dispinosnub snub prismatosnubdisnub tetris600pentis120. Its cell combos are 600 sissid-gikes, 600b ikes, 2400 2-choes, 600a siddies, 120b 5-tuts, 2400b tuts, 3600a stips, and 6000b trips. It is a blend of 5 sidphiphixes and 5 sidpip dixadies. 1605. Sadinsospid Sphihix - (SA din SOS pid SFI hix) small dispinosnub snub prismatodisnub pentis120hexis600. Its cell combos are 600 sissid-gikes, 600 gad-ikes, 2400 2-choes, 600a ideds, 600a sirds, 120b 5-tuts, 2400b tuts, and 6000b trips. It is a blend of 5 scaddip xuthis and 5 sidpip dixadies. These five dicho snubs has both sets of ike triangles, but no gike triangles. 1606. Sednasposid Sadixdox - (SED na SPOSS id sa DIX dox) small dispinosnub prismatosnubdisnub dis600dis600. Its cell combos are 600 2-ikes, 2400 2-choes, 600 siddy-siids, 6000a trips, and 3600b stips. It is a blend of 5 sidphippixhis and 5 siddip phixhis. 1607. Sadinspidos Xopex - (sa DIN spa dose ZO pex) small dispinosnub prismatodisnub 600pentis600. Its cell combos are 600b sissids, 600 2-ikes, 2400 2-choes, 600 siddy-siids, 600b sirds, and 6000a trips. It is a blend of 5 sidphippixhis and 5 sidphixthis. 1608. Sedansix Paspox - (se DAN six PAS pox) small dispinosnub 600 prismatosnub pentis600. Its cell combos are 600b sissids, 600 2-ikes, 2400 2-choes, 600 2-siids, 600b sirds, and 3600a stips. It is a blend of 5 siddip phixhis and 5 sidphixthis. 1609. Sednasposid Stixdox - (SED na SPOSS id STIX dox) small dispinosnub prismatosnubdisnub tris600dis600. Its cell combos are 600 ike-gads, 2400 2-choes, 600 siid-sidditdids, 600b ideds, 3600a stips, and 6000b trips. It is a blend of 5 siddip phixhis and 5 sibdip pidhixhis. 1610. Sedanspidshex - (se DAN spid shex) small dispinosnub prismatodisnub heptis600. Its cell combos are 600a sissids, 600 ike-gads, 2400 2-choes, 600 siid-sidditdids, 600a sirds, 600b ideds, and 6000b trips. It is a blend of 5 sidphixthis and 5 sibdip pidhixhis. These 18 idcossids are "ohoco" snubs, they have the oho-co combo as snub cell combos, they also have the 5-cho compound (gari) as a cell combo. 1611. Sosirsaspoxphi - (so SIR sa SPOX fee) small snubretrosnub snub pentis600pentis120. Its cell combos are 600b gikes, 600 ike-gads, 2400 oho-coes, 120 5-choes, 600b radeds, 600b sidditdids, 120a 5-tuts, and 2400a tuts. It is a blend of 5 sidpid hixadies and 5 sad phiddixes. 1612. Sosirstuxtix - (SO sir STUX tix) small snubretrosnub tetris600tris600. Its cell combos are 600 2-gikes, 600 ike-gads, 2400 oho-coes, 120 5-choes, 600b radeds, and 600 siddy-sidditdids. It is a blend of 5 sidpid hixadies and 5 sidpid hixhis. 1613. Sosirstixtux - (SO sir STIX tux) small snubretrosnub tris600tetris600. Its cell combos are 600b gikes, 600 ike-gads, 2400 oho-coes, 120 5-choes, 600a tis, 600a saddids, 600b radeds, and 600b sidditdids. It is a blend of 5 sidpid hixadies and 5 side phixadies. 1614. Sasrisastuxphi - (sa SRISS a STUX fee) small snubretrosnub snub tetris600pentis120. Its cell combos are 600b gikes, 600 2-ikes, 2400 oho-coes, 120 5-choes, 600b sirds, 120a 5-tuts, and 2400a tuts. It is a blend of 5 sidphixadies and 5 sad phiddixes. 1615. Sosershox - (SOS ser shox) small snubretrosnub hexis600. Its cell combos are 600 2-gikes, 600 2-ikes, 2400 oho-coes, 120 5-choes, 600b sirds, and 600a siddies. It is a blend of 5 sidphixadies and 5 sidpid hixhis. 1616. Sesorshex - (SES sor shex) small snubretrosnub heptis600. Its cell combos are 600 2-gikes, 600 gad-ikes, 2400 oho-coes, 120 5-choes, 600b sirds, 600a ideds, and 600a sidditdids. It is a blend of 5 sidphixadies and 5 sidpathihixes. 1617. Sosirsospid Sidoxphi - (SOS sir SOS pid sih DOX fee) small snubretrosnub snub prismatodisnub dis600pentis120. Its cell combos are 600b gikes, 600a ikes, 2400 oho-coes, 120 5-choes, 120a 5-tuts, 2400a tuts, and 6000b trips. It is a blend of 5 sidpapixhis and 5 sad phiddixes. 1618. Sosirspidstux - (SOS sir SPID stux) small snubretrosnub prismatodisnub tetris600. Its cell combos are 600 2-gikes, 600a ikes, 2400 oho-coes, 120 5-choes, 600a siddies, and 6000b trips. It is a blend of 5 sidpapixhis and 5 sidpid hixhis. 1619. Sosirspidspox - (SOS sir SPID spox) small snubretrosnub prismatodisnub pentis600. Its cell combos are 600 2-gikes, 600a gads, 2400 oho-coes, 120 5-choes, 600a ideds, 600a sidditdids, and 6000b trips. It is a blend of 5 sidpapixhis and 5 sidpathihixes. 1620. Sosirspid Sadixdax - (SOS sir spid sa DIX dax) small snubretrosnub prismatodisnub dis600dis600. Its cell combos are 600b gikes, 600a ikes, 2400 oho-coes, 120 5-choes, 600a tis, 600a saddids, and 6000b trips. It is a blend of 5 sidpapixhis and 5 side phixadies. 1621. Sosirspid Sadixtix - (SOS sir spid sa DIX tix) small snubretrosnub prismatodisnub dis600tris600. Its cell combos are 600 sissid-gikes, 600a ikes, 2400 oho-coes, 120 5-choes, 600a ideds, 600a saddids, and 6000b trips. It is a blend of 5 sidpapixhis and 5 sidputhixes. 1622. Sosirsospistoxphi - (SOS sir sos pis TOX fee) small snubretrosnub snub prismatosnub tris600pentis120. Its cell combos are 600b gikes, 600a ikes, 2400 oho-coes, 120 5-choes, 600b sidditdids, 120a 5-tuts, 2400a tuts, and 3600b stips. It is a blend of 5 siddip xappadies and 5 sad phiddixes. 1623. Sosirsapspox - (SOS sir SAP spox) small snubretrosnub prismatosnub pentis600. Its cell combos are 600 2-gikes, 600a ikes, 2400 oho-coes, 120 5-choes, 600 siddy-sidditdids, and 3600b stips. It is a blend of 5 siddip xappadies and 5 sidpid hixhis. 1624. Sosirspashox - (SOS sir SPASH shox) small snubretrosnub prismatosnub hexis600. Its cell combos are 600 2-gikes, 600a gads, 2400 oho-coes, 120 5-choes, 600 2-sidditdids, 600a ideds, and 3600b stips. It is a blend of 5 siddip xappadies and 5 sidpathihixes. 1625. Sosirsaps Dextix - (SOS sir saps DEX tix) small snubretrosnub prismatosnub dis600tris600. Its cell combos are 600b gikes, 600a ikes, 2400 oho-coes, 120 5-choes, 600a tis, 600a saddids, 600b sidditdids, and 3600b stips. It is a blend of 5 siddip xappadies and 5 side phixadies. 1626. Sosirsaps Textix - (SOS sir saps TEX tix) small snubretrosnub prismatosnub tris600tris600. Its cell combos are 600 sissid-gikes, 600a ikes, 2400 oho-coes, 120 5-choes, 600a ideds, 600a saddids, 600b sidditdids, and 3600b stips. It is a blend of 5 siddip xappadies and 5 sidputhixes. 1627. Sosirsosphipox - (SOS sir SOS fee pox) small snubretrosnub snub pentis120pentis600. Its cell combos are 600b sissids, 600 2-ikes, 2400 oho-coes, 120 5-choes, 600b radeds, 600b saddids, 120a 5-tuts, and 2400a tuts. It is a blend of 5 sidpuxthis and 5 sad phiddixes. 1628. Sosirsadixpox - (SOS sir da DIX pox) small snubretrosnub dis600pentis600. Its cell combos are 600 gike-sissids, 600 2-ikes, 2400 oho-coes, 120 5-choes, 600b radeds, 600b saddids, and 600a siddies. It is a blend of 5 sidpuxthis and 5 sidpid hixhis. These 21 idcossids are "ohocho" snubs, they have the oho-cho combo as snub cell combos, they also have the 5-co compound (arie) as a cell combo. 1629. Snarsisdoxphi - (SNAR sis DOX fee) small spinoretrosnub snub dis600pentis120. Its cell combos are 600a ikes, 2400 oho-choes, 120 5-coes, 600b ris, 120a 5-tuts, and 2400a tuts. It is a blend of 5 sad phiddixes and 5 sidpaxhis. 1630. Snarsispoxphi - (SNAR sis POX fee) small spinoretrosnub snub pentis600pentis120. Its cell combos are 600b sissids, 600 ike-gads, 2400 oho-choes, 120 5-coes, 600b radeds, 600b siddies, 120a 5-tuts, and 2400a tuts. It is a blend of 5 sad phiddixes and 5 scadupthixes. 1631. Snarsistuxphi - (SNAR sis TUX fee) small spinoretrosnub snub tetris600pentis120. Its cell combos are 600 ike-gads, 2400 oho-choes, 120 5-coes, 600b tis, 600b sirds, 120a 5-tuts, and 2400a tuts. It is a blend of 5 sad phiddixes and 5 snib dapixthis. 1632. Snarsis Pastuxphi - (SNAR sis pa STUX fee) small spinoretrosnub snub prismatosnub tetris600pentis120. Its cell combos are 600b sissids, 600 ike-gads, 2400 oho-choes, 120 5-coes, 600b tis, 120a 5-tuts, 2400a tuts, and 3600b stips. It is a blend of 5 sad phiddixes and 5 sicdip pixthis. 1633. Snarsis Pistaxphi - (SNAR sis pe STAX fee) small spinoretrosnub snub prismatosnub tris600pentis120. Its cell combos are 600b sissids, 600a ikes, 2400 oho-choes, 120 5-coes, 600b siddies, 120a 5-tuts, 2400a tuts, and 3600b stips. It is a blend of 5 sad phiddixes and 5 sidphiphixes. 1634. Snarsasphipox - (snar SAS fe pox) small spinoretrosnub snub pentis120pentis600. Its cell combos are 600b sissids, 600 ike-gads, 2400 oho-choes, 120 5-coes, 600b ideds, 600b sirds, 120a 5-tuts, and 2400a tuts. It is a blend of 5 sad phiddixes and 5 scaddip xuthis. 1635. Snarstux - (SNAR stux) small spinoretrosnub tetris600. Its cell combos are 600a gikes, 600a ikes, 2400 oho-choes, 120 5-coes, 600a siddies, and 600b ris. It is a blend of 5 sidpid hixhis and 5 sidpaxhis. 1636. Snarshex - (SNAR shex) small spinoretrosnub heptis600. Its cell combos are 600 gike-sissids, 600 ike-gads, 2400 oho-choes, 120 5-coes, 600 2-siddies, and 600b radeds. It is a blend of 5 sidpid hixhis and 5 scadupthixes. 1637. Snarshax - (SNAR shax) small spinoretrosnub hexis600. Its cell combos are 600a gikes, 600 ike-gads, 2400 oho-choes, 120 5-coes, 600a siddies, 600b tis, and 600b sirds. It is a blend of 5 sidpid hixhis and 5 snib dapixthis. 1638. Snarspishax - (SNAR spe shax) small spinoretrosnub prismatosnub hexis600. Its cell combos are 600 gike-sissids, 600 ike-gads, 2400 oho-choes, 120 5-coes, 600a siddies, 600b tis, and 3600b stips. It is a blend of 5 sidpid hixhis and 5 sicdip pixthis. 1639. Snarsapspox - (snar SAP spox) small spinoretrosnub prismatosnub pentis600. Its cell combos are 600 gike-sissids, 600a ikes, 2400 oho-choes, 120 5-coes, 600 2-siddies, and 3600b stips. It is a blend of 5 sidpid hixhis and 5 sidphiphixes. 1640. Snarstuxtix - (snar STUX tix) small spinoretrosnub tetris600tris600. Its cell combos are 600 gike-sissids, 600 ike-gads, 2400 oho-choes, 120 5-coes, 600a siddies, 600b ideds, and 600b sirds. It is a blend of 5 sidpid hixhis and 5 scaddip xuthis. 1641. Sranishex - (SRAN e shex) small retrospinosnub heptis600. Its cell combos are 600a gikes, 600 2-gads, 2400 oho-choes, 120 5-coes, 600a ideds, 600a sidditdids, 600b tis, and 600b sirds. It is a blend of 5 sidpathihixes and 5 snib dapixthis. 1642. Sranisapshex - (SRAN e SAP shex) small retrospinosnub prismatosnub heptis600. Its cell combos are 600 gike-sissids, 600 2-gads, 2400 oho-choes, 120 5-coes, 600a ideds, 600a sidditdids, 600b tis, and 3600b stips. It is a blend of 5 sidpathihixes and 5 sicdip pixthis. 1643. Sranisipshax - (SRAN e SIP shax) small retrospinosnub prismatosnub hexis600. Its cell combos are 600 gike-sissids, 600a gads, 2400 oho-choes, 120 5-coes, 600a ideds, 600 sidditdid-siddies, and 3600b stips. It is a blend of 5 sidpathihixes and 5 sidphiphixes. 1644. Sarnistux - (sar NISS tux) small retrospinosnub tetris600. Its cell combos are 600a ikes, 2400 oho-choes, 120 5-coes, 600a tis, 600a saddids, and 600b ris. It is a blend of 5 side phixadies and 5 sidpaxhis. 1645. Sranistixtux - (SRAN e STIX tux) small retrospinosnub tris600tetris600. Its cell combos are 600b sissids, 600 ike-gads, 2400 oho-choes, 120 5-coes, 600a tis, 600a saddids, 600b siddies, and 600b radeds. It is a blend of 5 side phixadies and 5 scadupthixes. 1646. Sarnsips Dextux - (SARN sips DEX tux) small retrospinosnub prismatosnub dis600tetris600. Its cell combos are 600b sissids, 600 ike-gads, 2400 oho-choes, 120 5-coes, 600 2-tis, 600a saddids, and 3600b stips. It is a blend of 5 side phixadies and 5 sicdip pixthis. 1647. Sranisapspox - (SRAN e SAP spox) small retrospinosnub prismatosnub pentis600. Its cell combos are 600b sissids, 600a ike, 2400 oho-choes, 120 5-coes, 600a tis, 600a saddids, 600b siddies, and 3600b stips. It is a blend of 5 side phixadies and 5 sidphiphixes. 1648. Snarsipshex - (snar SIP shex) small spinoretrosnub prismatosnub heptis600. Its cell combos are 600 2-sissids, 600 ike-gads, 2400 oho-choes, 120 5-coes, 600a ideds, 600a saddids, 600b tis, and 3600b stips. It is a blend of 5 sidputhixes and 5 sicdip pixthis. 1649. Snarsip Sadixtux - (SNAR sip sa DIX tux) small spinoretrosnub prismatosnub dis600tetris600. Its cell combos are 600 2-sissids, 600a ike, 2400 oho-choes, 120 5-coes, 600a ideds, 600a saddids, 600b siddies, and 3600b stips. It is a blend of 5 sidputhixes and 5 sidphiphixes. These 19 idcossids are "cocho" snubs, they have the co-cho combo as snub cell combos, they also have the 5-oho compound (iddei) as a cell combo. 1650. Sosenshex - (SOS en shex) small snubspinosnub heptis600. Its cell combos are 600a gikes, 600 2-gads, 2400 co-choes, 120 5-ohoes, 600a sidditdids, 600a radeds, 600b tis, and 600b sirds. It is a blend of 5 sidpid hixadies and 5 snib dapixthis. 1651. Sosenspeshex - (SOS en SPE shex) small snubspinosnub prismatosnub heptis600. Its cell combos are 600 gike-sissids, 600 2-gads, 2400 co-choes, 120 5-ohoes, 600a sidditdids, 600a radeds, 600b tis, and 3600b stips. It is a blend of 5 sidpid hixadies and 5 sicdip pixthis. 1652. Sosenspashox - (SOS en SPA shox) small snubspinosnub prismatosnub hexis600. Its cell combos are 600 gike-sissids, 600a gads, 2400 co-choes, 120 5-ohoes, 600 sidditdid-siddies, 600a radeds, and 3600b stips. It is a blend of 5 sidpid hixadies and 5 sidphiphixes. 1653. Sosenstux - (SOS en stux) small snubspinosnub tetris600. Its cell combos are 600a gikes, 600a ikes, 2400 co-choes, 120 5-ohoes, 600a sirds, and 600b ris. It is a blend of 5 sidphixadies and 5 sidpaxhis. 1654. Sosnastixtux - (so SNASS stix tux) small snubspinosnub tris600tetris600. Its cell combos are 600 gike-sissids, 600 ike-gads, 2400 co-choes, 120 5-ohoes, 600a sirds, 600b siddies, and 600b radeds. It is a blend of 5 sidphixadies and 5 scadupthixes. 1655. Sosenspostuxdex - (SOS en SPOSS tux dex) small snubspinosnub prismatosnub tetris600dis600. Its cell combos are 600 gike-sissids, 600 ike-gads, 2400 co-choes, 120 5-ohoes, 600a sirds, 600b tis, and 3600b stips. It is a blend of 5 sidphixadies and 5 sicdip pixthis. 1656. Sosenspospix - (SOS en SPOS pix) small snubspinosnub prismatosnub pentis600. Its cell combos are 600 gike-sissids, 600a ikes, 2400 co-choes, 120 5-ohoes, 600a sirds, 600b siddies, and 3600b stips. It is a blend of 5 sidphixadies and 5 sidphiphixes. 1657. Sosenspidsadex - (SOS en SPID sa dex) small snubspinosnub prismatodisnub dis600. Its cell combos are 600a gikes, 2400 co-choes, 120 5-ohoes, 600b ris, and 6000a trips. It is a blend of 5 sidpapixhis and 5 sidpaxhis. 1658. Sosenspidspox - (SOS en SPID spox) small snubspinosnub prismatodisnub pentis600. Its cell combos are 600 gike-sissids, 600b gads, 2400 co-choes, 120 5-ohoes, 600b radeds, 600b siddies, and 6000a trips. It is a blend of 5 sidpapixhis and 5 scadupthixes. 1659. Sosenspidstux - (SOS en SPID stux) small snubspinosnub prismatodisnub tetris600. Its cell combos are 600a gikes, 600b gads, 2400 co-choes, 120 5-ohoes, 600b tis, 600b sirds, and 6000a trips. It is a blend of 5 sidpapixhis and 5 snib dapixthis. 1660. Sosenspisidstux - (SOS en SPISS id stux) small snubspinosnub prismatosnubdisnub tetris600. Its cell combos are 600 gike-sissids, 600b gads, 2400 co-choes, 120 5-ohoes, 600b tis, 3600b stips, and 6000a trips. It is a blend of 5 sidpapixhis and 5 sicdip pixthis. 1661. Sosenspasidstix - (SOS en SPASS id stix) small snubspinosnub prismatosnubdisnub tris600. Its cell combos are 600 gike-sissids, 2400 co-choes, 120 5-ohoes, 600b siddies, 3600b stips, and 6000a trips. It is a blend of 5 sidpapixhis and 5 sidphiphixes. 1662. Sosenspid Sadixtix - (SOS en spid sa DIX tix) small snubspinosnub prismatodisnub dis600tris600. Its cell combos are 600 gike-sissids, 600b gads, 2400 co-choes, 120 5-ohoes, 600b ideds, 600b sirds, and 6000a trips. It is a blend of 5 sidpapixhis and 5 scaddip xuthis. 1663. Sosanspistax - (sa SAN spe stax) small snubspinosnub prismatosnub tris600. Its cell combos are 600a gikes, 2400 co-choes, 120 5-ohoes, 600a sidditdids, 600b ris, and 3600a stips. It is a blend of 5 siddip xappadies and 5 sidpaxhis. 1664. Sosanspos Textix - (so SAN spose TEX tix) small snubspinosnub prismatosnub tris600tris600. Its cell combos are 600 gike-sissids, 600b gads, 2400 co-choes, 120 5-ohoes, 600 sidditdid-siddies, 600b radeds, and 3600a stips. It is a blend of 5 siddip xappadies and 5 scadupthixes. 1665. Sosanspos Dextix - (so SAN spose DEX tix) small snubspinosnub prismatosnub dis600tris600. Its cell combos are 600a gikes, 600b gads, 2400 co-choes, 120 5-ohoes, 600a sidditdids, 600b sirds, 600b tis, and 3600a stips. It is a blend of 5 siddip xappadies and 5 snib dapixthis. 1666. Sosanspos Duxtix - (so SAN spose DUX tix) small snubspinosnub prismatosnub dis600tetris600. Its cell combos are 600 gike-sissids, 600b gads, 2400 co-choes, 120 5-ohoes, 600a sidditdids, 600b ideds, 600b sirds, and 3600a stips. It is a blend of 5 siddip xappadies and 5 scaddip xuthis. 1667. Sosanspos Tuxtix - (so SAN spose TUX tix) small snubspinosnub prismatosnub tris600tetris600. Its cell combos are 600 2-sissids, 600 ike-gads, 2400 co-choes, 120 5-ohoes, 600a radeds, 600a saddids, 600b tis, and 3600b stips. It is a blend of 5 sidpuxthis and 5 sicdip pixthis. 1668. Sosanspos Xopex - (so SAN spose ZO pex) small snubspinosnub prismatosnub 600pentis600. Its cell combos are 600 2-sissids, 600a ikes, 2400 co-choes, 120 5-ohoes, 600a radeds, 600a saddids, 600b siddies, and 3600b stips. It is a blend of 5 sidpuxthis and 5 sidphiphixes. Conjugates are the dircospids. They can be found by adding 177 to the number. Small is changed to great. For the short name, if the second letter in not "p", then change the first letter "s" to "g" - otherwise change "spo" to "gopi".